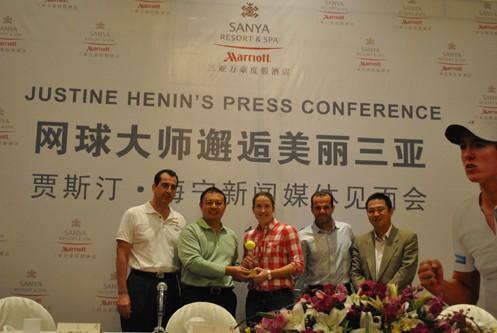 Sanya Marriott Resort and Spa recently welcomed Justine Henin, the international tennis star, for a two-week stay while she was in training for the 2011 Australian Open. She was attracted to Sanya by the warm weather, which is ideal for training and is similar to the current climate in Australia. The tennis star is also interested in helping to promote tennis in its fastest growing market. In addition to a vigorous training schedule, Henin is will also conduct some clinics for local tennis enthusiasts. To mark the occasion she held a press conference and presented a tennis ball with her signature to the Sanya Culture, Sports and Publications Bureau.